Imagine if there had been some kind of crime committed last Tuesday evening between 7.15 pm and 10.45 pm in Dublin. Imagine I was a suspect and they sent a police officer out to ascertain my whereabouts and to investigate my alibi. -What did you find out about Armstrong, Officer Dibble? -He has no alibi, Sir. -There was nobody with him. -For the entire three and a half hours? Where was he? -He can’t really say, Sir. He was ‘around’. ‘Here and there’. Last Tuesday night, there was a gig in The Olympia in Dublin and I brought Sam to see it. We met with John, his brother, my other son (get it?) and some other pals and off they went. Between 7.15pm, when they went in, and 10.45, when they came back out again, I was all alone in Dublin with nobody to see and nothing to do. It would seem obvious that I would have spent some of the time in a restaurant or a coffee shop. Lingering over a bun or a book. But no, we ate before the gig. I had a take-away coffee from a place, quite late on, but that was all. I must have met somebody, we must have had a good old chat. Maybe we had a pint. Nope and nope and nope. I was driving home later that evening so there was no alcohol. Also I’m pretty shy about announcing that I am in Dublin and arranging to meet people. I don’t really do that. So, by now, you may start to share some of the frustration of poor Officer Dibble who only really wanted to exclude me from the investigation because I seemed nice. What did I do for all those hours? I wandered around. That’s what I did. I walked up one street and down another. I cut up little streets and alleys to see what was up there. I looked in shop windows and peered up at new buildings under construction. Basically, I slowed down for a few hours. Life is pretty full-on, for me at least. There’s quite a lot of coming-and-going. There’s stuff to be thought about and worried about and acted upon. But at 7.15pm on Tuesday evening, I was released from all that. I could just ‘drift’. So that’s what I did, I drifted. I wasn’t bored. I wasn’t wishing time would move a little quicker so that the concert would be over and I could get back on the long drive home. None of that. If it had been raining, it would have been different. More awkward. But it was a lovely evening with a promise of spring in the air and I ‘wandered lonely as a cloud’, as you do sometimes. Right? It’s not as odd as it might sound. I kept myself entertained. I watched some buskers. I chatted for quite a long time to a huge bouncer outside a bar in some alleyway somewhere. He had a degree in Economics and liked to wind up the clampers who happened by. Here's one little thing I did which might serve as a microcosm of my evening. 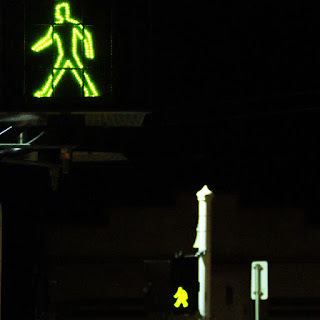 At one point, somewhere down near Pearse Street, I found a pedestrian light that made a sort of fast paced ‘duh-duh-duh-duh-duh-duh’ noise when it was time to cross. After I realised that the ‘duh-duhs’ were in perfect time with the ones in the song ‘Don’t You Want Me, Baby?’ by The Human League, I hung around for a while, running the tune in my head and enjoying the tiny serendipity of my discovery. Try telling that one to Officer Dibble. See where it gets you. This kind of cutting adrift in the big city might not seem entirely safe or even entirely sane but I find it does me a little good. An occasional slipping of the gears, letting the car roll downhill gently under its own steam. No engine noise, no real purpose. It allows time for a little perspective to be recovered. It reminds me that the world is a much bigger place, with a lot more people in it, than I normally acknowledge. And the gig was super too, apparently, which was also pretty good. This reminded me of ‘The Pedestrian’ by Ray Bradbury. I can’t imagine you’ve lived this long and not come across it but in case you have here’s link to a short animation that does the job far better than the padded version we got to see in The Ray Bradbury Theatre despite David Ogden Stiers trying his best. You can also find that version on YouTube if you’re interested. The actual short story—it is very short—can be found here. I love the bit in the story where when the police car asks him what his job is—to which he responds, "I guess you'd call me a writer"—it interprets that as, "No profession." I don’t wander much these days. Certainly not at night. Not sure the last time I ventured further than my back garden after four in the afternoon. Actually I can. There was an eclipse a wee while back and I slipped out in the early hours to try to get a better look. But that’s it. As a kid, and especially as a teenager, I was always out and about. I kinda miss that. Again, like you, I would’ve had a hard job explaining to anyone what I was doing. I’d probably say, "Looking for inspiration," if pressed. That was in the days when I couldn’t sit around waiting for it; I had no patience for anything at that age. As always your experience mirrors my own. I love an opportunity to lose myself in a place for a few hours. Thanks to Jim for those links too, I'm going to indulge in those now.